New York, NY. 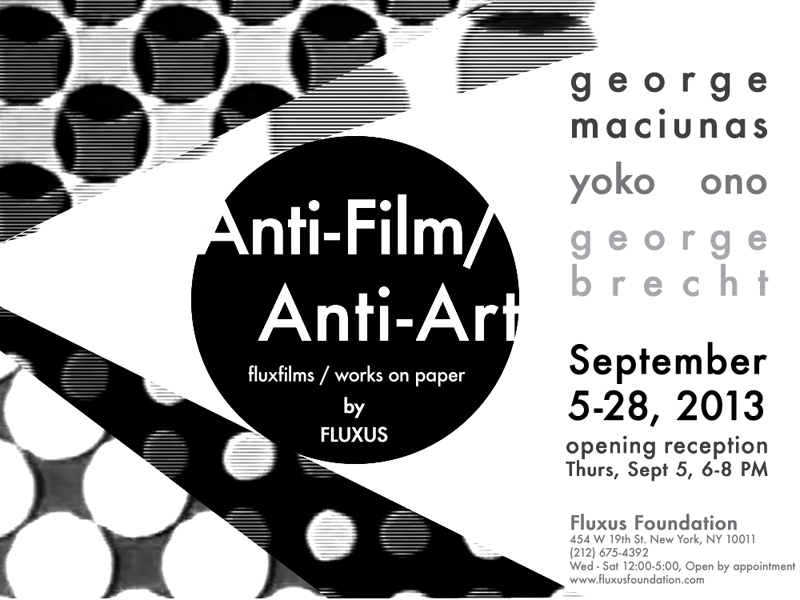 Fluxus Foundation is pleased to present Anti-Film / Anti-Art in the foundation exhibition space at 454 W 19th St. The exhibition features the world premiere of Fluxfilm 2(1966), a 16mm 20-minute original George Maciunas cut. “Promote living art, anti-art, promote NON-ART REALITY,” declares Fluxus founder and central organizer George Maciunas, in his 1963 Manifesto. The document, which combines handwritten notes with collaged dictionary entries for the word flux, lays out the objectives of Fluxus, emphasizing purging the world of “dead art, imitation, artificial art” and calling for “a revolutionary flood and tide in art.” In other words, Maciunas opposed the commercial landscape of art—and, like his Dada contemporaries before him, sought to incite a true anti-art movement. Famously interdisciplinary, Fluxus’s anti-art also extended notably into the realm of film. Coined “anti-films,” Fluxfilms were radical interpretations of the medium, devoid of film’s traditional narrative and highly representational structure. Exhibited for the very first time, Fluxfilm 2 is a 20-minute loop cut by Maciunas from the 120-minute Fluxfilm Anthology. Distilled down to flashing black-and-white frames, Maciunas emphasizes visual assault over the passive viewing normally associated with watching films. Displayed adjacent to Fluxfilm 2 are three original Maciunas-commissioned Fluxfilms. One by Yoko Ono depicts a high-speed sequence of a match striking fire. George Brecht’s ENTRANCE to EXIT features entrance and exit door signs, fading through black and white. George Maciunas’sARTYPE is a cameraless film featuring benday dots and line patterns. These anti-films are silent, black-and-white, and overturn traditional filmmaking by involving direct manipulation of film reels and developing processes. Also on display are Yoko Ono’s DO IT YOURSELF FLUXFEST—a calendar of Fluxus events illustrated by Ono in 1965, George Brecht’s event scores, and excerpts from An Anthology, one of Fluxus’s earliest publications. Like the anti-films, George Maciunas performed instrumental roles in these works, as either a designer, initiator, or editor. Indeed, each work on display is a reflection of not only Fluxus, but of the genius and humor of George Maciunas. Without him, Anti-Film / Anti-Art would never have come to be.